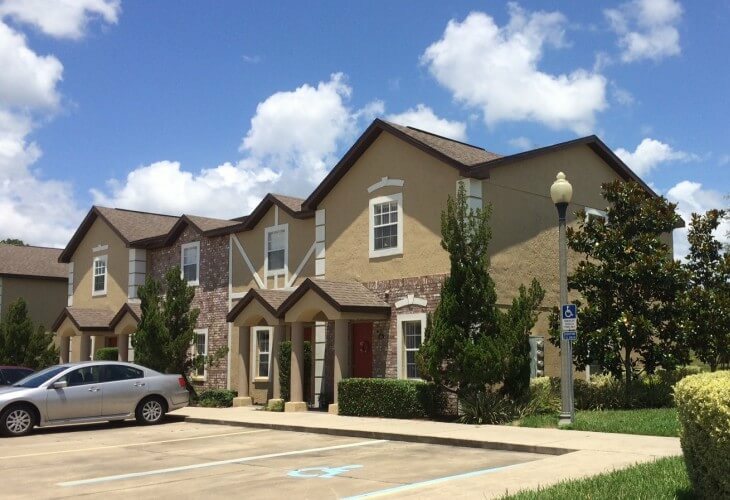 Carmendy Square Townhomes is a 152-unit townhouse style multifamily community located in Lady Lake, Florida. The property is located off US Highway 441 and within close proximity of “The Villages” – the fastest growing metropolitan area in the US, and approximately 25 miles south of Ocala and 50 miles west of Orlando. The property was acquired in joint venture with Balfour Beatty Communities of Malvern, PA.
Carmendy Square was developed in 1999 and consists of 152 two and three-bedroom townhouse-style residences averaging 1212 square feet. Amenities include clubhouse, sport court, playground, swimming pool, Bark Park, 24-hr fitness facility and Internet Café’. All units are equipped with full size washer/dryer, ceramic tile flooring, large bedrooms and walk-in closets. A comprehensive property enhancement program will begin in the fall of 2014 and will focus on upgrades to the interior finishes and community amenity package. Upon completion of the capital program, the asset will be held in portfolio for long term cash flow and appreciation.